It’s been quite while since I posted anything on here but it’s been even longer since I’ve seen a geared moped for sale! Over the past two decades we’ve seen a massive influx of automatic scooters which are now flooding our roads. The geared moped seemed to be a thing of the past despite obvious demand from our customers and our customer’s children. Whatever the reason for this, there’s been a massive gap in the market which has now been filled. And this bike is exciting! If I was 16 again I’d be saving every single penny I earned until I had one in my grasp. 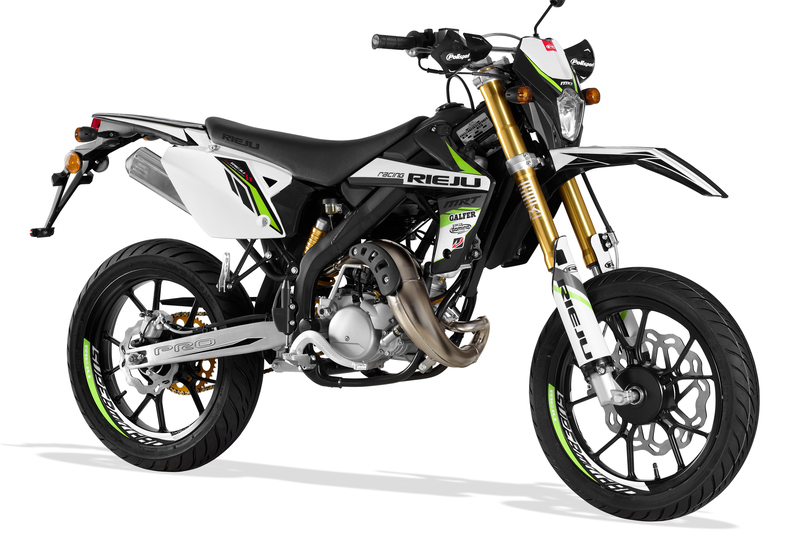 Rieju are a Spanish brand who have been consistent favourites of the European market with their excellent build quality and ultra-reliable Yamaha-Minarelli engined range of bikes. The quality and detail of these machines has to be seen to be believed. They’ve been steadily increasing their market share in the UK over the past few years and now they’re available in Leicester. Direct from Fasttrack Motorcycles. This MRT Pro 50 Supermotard comes with Marzocchi USD forks, Galfer disks and Michelin tyres as standard! It also boasts an aluminium swing arm and silencer, LED lights and progressive rear suspension. On a moped!?! Insanity. But not as insane as the price tag. You get all this for just £2549 on the road. All you have to do is insure it. No hidden extras, nothing more to pay. Unless of course you want to modify it, because there’s also a massive range of performance upgrades and cosmetic refinements which you can bolt on at your leisure with no penalty whatsoever to your warranty. Yes, you read that right, manufacturer endorsed performance upgrades which don’t affect your warranty. Told you these were insane. So why not come to the shop and take a look. Just one glance is all it takes and the quality speaks for itself. And while you’re there why not take a look at the other bikes we have from the RIEJU range as well. The title of this post says it all really – we now have a fantastic selection of top quality, new learner legal 125cc bikes for sale. And they start at just £1250 on the road! That’s a brand new learner legal cheap viagra online 125cc bike with 12 months road tax and fully registered to you! No hidden extras, no extra fees; one price, one bike. All you need to do is insure it. Sounds cheap for a brand new 125 doesn’t it? That’s because it is. We have probably the cheapest and best range of high quality learner legal bikes in the Midlands. Granted there are some other motorcycle shops with cheaper offerings but they simply don’t have the range we do and often the quality is much lower too. We only sell 125cc bikes from brands we know and trust who offer a full spares back up. Brands such as Suzuki, Sinnis and Superbyke. So if you’re a perpetual L-Plater and need a new 125, or a new rider, maybe you have friends who would be interested in anything from the world of the Learner Legal 125’s… Whatever the reason, head on down to Fasttrack and check out the full range of 125cc bikes we have for sale.